For pattern-transferring advice, we consulted professional decorative painter Jackie Shaw, whose methods you'll find easy to master. Use them and your painted pieces will win compliments as never before. Patterns are key to painting success. Whether you're transferring the main outline of a design or adding intricate details, the pattern guides you to picture-perfect results. In her book, The Big Book of Decorative Painting (Watson-Guptill Publications, 1994), author Jackie Shaw includes a chapter with tips and techniques for copying patterns and transferring designs to base-coated projects. We'll give you four foolproof methods for transferring patterns -- along with a few tips from Jackie. But first, before you transfer a pattern, copy the outlines of the design on tracing paper. Jackie encourages painters to take the liberty of re-creating the pattern while they copy it. "Move the tracing paper around the pattern so you can rearrange, add, or subtract elements as you go along," Jackie says. 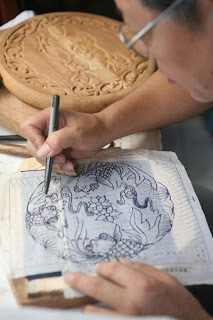 Next, using one of the four methods following below, transfer the design onto the base-coated wood. These echniques require simple tools like chalk, a No. 2 pencil, tracing paper, and commercial transfer paper. Retrace the pattern lines or rub the back of the pattern with chalk. Turn the traced pattern face down, and retrace the lines with a chalk pencil or rub the back with chalk. Then position the pattern, chalk side down, on the base-coated surface. Using a stylus, retrace the lines. 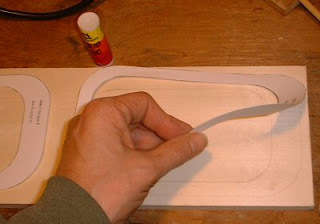 Apply very little pressure, or you'll make grooves on the wood surface. "Chalk is my personal choice for transferring patterns because it's easy to remove, and it allows for creativity and alterations without ever leaving behind a 'ghost' of the pattern," Jackie says. Rub the back of the pattern with a No. 2 pencil. With the traced pattern face down, hold the pencil horizontally on the paper while applying the graphite. Lightly wipe off the excess graphite dust. Then place the pattern, treated side down, on the base-coated surface and retrace the lines with a stylus. Apply the pattern with commercial transfer paper. Check at local crafts stores or art-supply stores for special artist's transfer paper -- several brands are available. Slide the sheet of transfer paper, treated side down, between the pattern and the base-coated surface, and trace over the lines as directed above. Although it might be tempting to substitute carbon paper for the transfer paper, "it's best not to use it because over time it will bleed through paint," Jackie says. Make your own transfer paper. You'll need tracing paper and several pieces of chalk, both white and colored. To make light sheets of transfer paper (to use on medium- and dark-colored surfaces), rub one side of each piece of tracing paper completely with a piece of cheap white chalk. (Do not use artist's pastel chalk because its wax base can mar your painting.) Rub the chalk into the paper with your fingers. Then shake off any excess chalk. For dark sheets of transfer paper, use colored chalk or a pencil. Shake off any excess chalk or graphite. Store the sheets by folding the treated sides together. • When transferring a pattern, place a sheet of waxed paper on top of it to help you keep track of lines already traced. The stylus will etch the wax paper as you work, showing clearly where you've traced. • To remove chalk or transfer-paper pattern lines after painting, rub off marks with a soft cloth dampened with clean water. Graphite or other commercial transfer papers may require mineral spirits. • Transfer as little of the design as possible to the wood. This will allow you to be more creative with painting. Thanks for sharing your tips here! I really like getting creative with wood - there are endless possibilities and details you can add to the finished product. Previously, we have only thought that wood materials are mostly using for flooring and making furniture. But here this article changes the whole concept that; woods are also using for making different patterns which are rather used for painting purposes. Thanks for highlighting such a wonderful topic.